Our hearing aid industry specific newsletter program makes it easy to stay in contact with your patients. Every newsletter has a story to tell. Let our team give your publication a life of its own with eye-catching images, informative articles, and a professional layout. 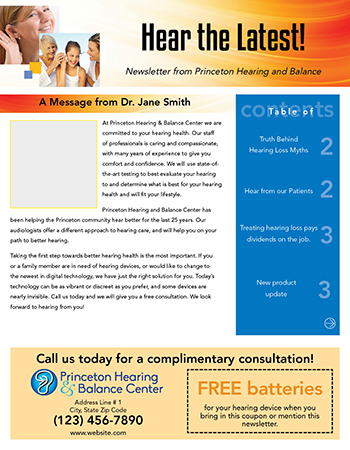 We can spruce up your existing newsletter or use one of our hearing market specific newsletters. Remember: If you are not mailing to your prospects and patients, your competition is! Please contact us for more information on how to get started.